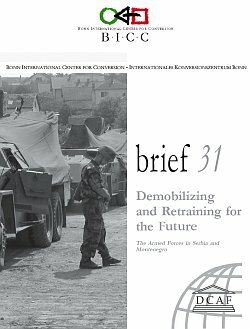 BICC brief 31, issued jointly by the Geneva Center for the Democratic Control of the Armed Forces (DCAF) and the Bonn International Center for Conversion (BICC), is the product of a series of activities conducted by these organizations on “Demobilization and Reintegration in the Western Balkans”. A description and analysis of the main resettlement and retraining project of the Ministry of Defense in Serbia and Montenegro, entitled PRISMA. The main goal of this brief is to provide an overview over the most pressing issues related to the ongoing military reform. The author tries to derive from the analysis recommendations for policy makers and researchers regarding the future financing, composition and size of the VSCG, as well as the treatment of war veterans, pensioners and future redundant military personnel. The author also makes recommendations for the PRISMA project on activities, cooperation and funding.